Greg gave me a pair a new snowshoes for Christmas and I’ve been snowshoeing like mad ever since, although haven’t had much time to post about it. No more fighting with the leather straps of the old wood ones – now my modern bindings just snap on and tighten with a few clicks! I don’t even have to take my mittens off to do this, which has been a relief in the sub-zero temperatures Hayward has been under. My first day out with the new snowshoes, and Greg decides he is going to give it a shot with the old wooden ones and come along. 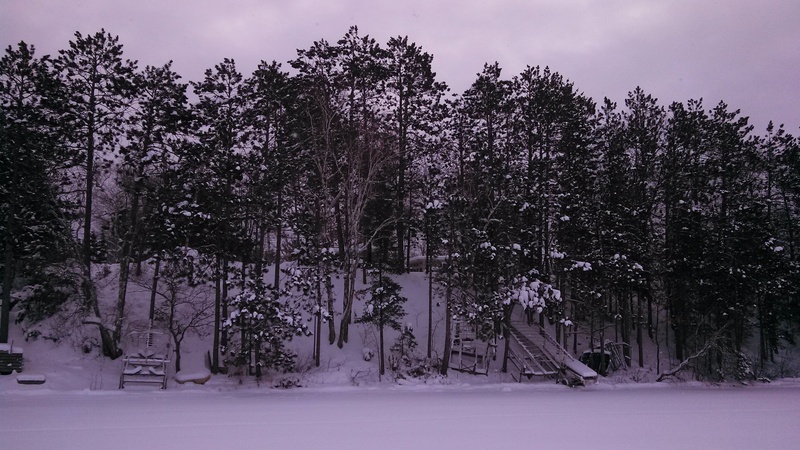 Greg suggests we hike out to Point of Pines on Lac Courte Oreilles – one of our fishing spots during open water, because he’d like to scope out ice fishing spots. “Sure we can do that” and I warn him that the deep snow might make such a long journey across the lake challenging, but Greg is full of bravado and dismisses my concerns. It didn’t take us long to get ready and strapped into our footwear. Dolly, of course, was crazy with joy over another snowshoeing trip and was tirelessly barking out in the yard – everyone has a lot of energy at the start of one of these adventures! Dolly and I both take advantage of the well-trodden path to the woods’ edge, after all, the rest of the course will be quite a brutal workout. Greg, on the other hand, ignores this information and decides to cut a new trail across a field of fresh snow. We watch his energetic striding through the deep; he was animated and euphoric. Dolly and I had both been at that high-energy stage before and it doesn’t last long. Dolly knowingly winked at me and we continued on. Our trampled path got us to the forest before Greg’s route did, and Dolly didn’t want to wait for him to catch up. Her favorite destination is always the woods – she instantly switches into hunting mode. Alert to any noises or movement, her stumpy little tail is held straight up, like a flag, quivering as she stalks and pounces on snow-covered lairs along the winter underbrush. Her passion for hunting is a thrill to watch! We forged ahead, hunting along the way, and soon Greg caught up with us. Another splendid walk through these majestic woods. The feeling is difficult to describe – it is just simply peaceful, natural, beautiful. I glance back at Greg occasionally and see that the old wood snowshoes are working well for him. 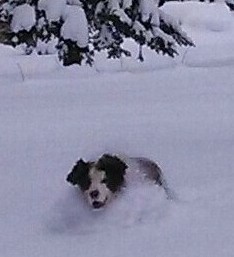 I can’t help but feel a twinge of wistfulness that he has my snowshoes on and is clearly enjoying it! Soon we are at the clearing and begin down the hill to the little private boat landing. Dolly knows where we are headed so she runs ahead on the path we already made. The snow isn’t as deep on this hillside so I cut a new path along the primitive roadway and Greg followed in the old wooden snowshoes. 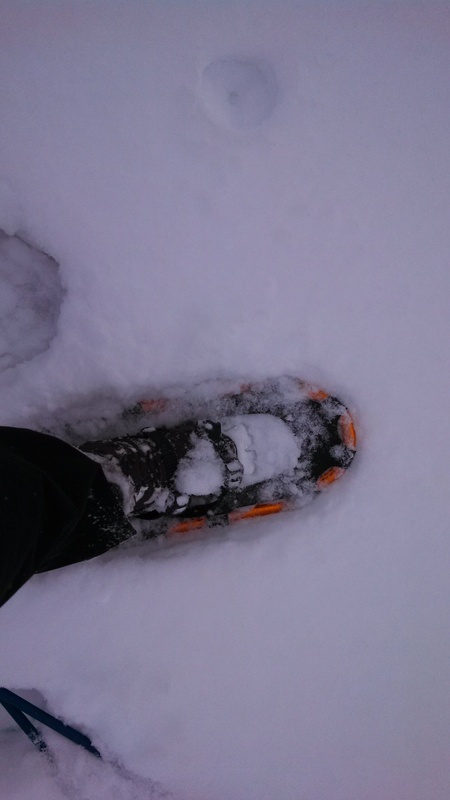 I like my new snowshoes a lot – they are much smaller than the wooden ones which makes them easier to walk in but I sink down into the snow further than I did with the larger base of the wood snowshoes. My footwear now has metal claws called ‘crampons’ to assist my hikes over difficult terrain. This time we have our ski poles with us too – they really help balance us when walking over uneven ground. Don’t laugh, you young people – at some point in your life, you too will wonder what happened to the keen sense of balance you once possessed. Finally all three of us are out on the frozen tundra of this immense lake and we head south towards Point of Pines. We accidentally discovered this fishing spot a few summers ago – it has magnificent, sudden drop-offs and wild underwater terrain that took us a while to figure out. We think it will be a challenging place to ice fish also. We were steamrolling right along at a pretty good clip and I glanced over at Greg. His face was beet red and he looked winded. 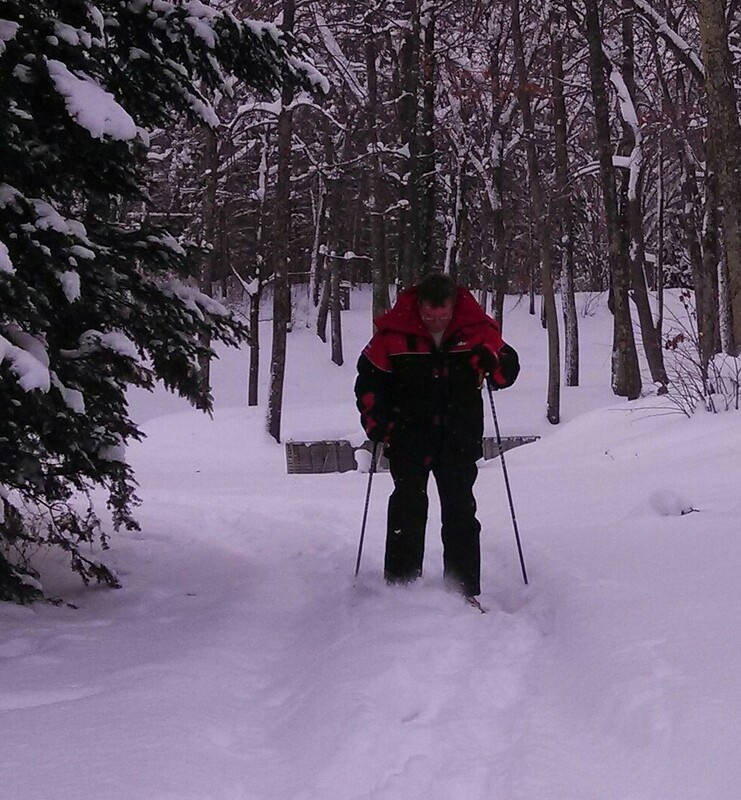 Greg is extraordinarily strong – I’ve seem him lift things, build thing, cut down things that many other men could not do, but I think the intense aerobic nature of snowshoeing was not something his body was ever well-prepared for. For an instance, I chastised myself for not bringing along some regular aspirin, just in case ‘the big one’ decided to pay him a visit. I’ll have to be better prepared next time – perhaps locate one of those mountain dog rescue barrels for Dolly’s collar. We were almost beyond the shoreline of our meandering bay, soon we’d be in the open heading towards Point of Pines. Greg must of realized this and stopped, pretending to admire the vast blue skyline. We stood there for a few minutes more, pondering the next long leg of our journey when Greg decidedly announced he’s had enough for one day and motioned back towards the hill leading up to the cabin on Wolf Point. 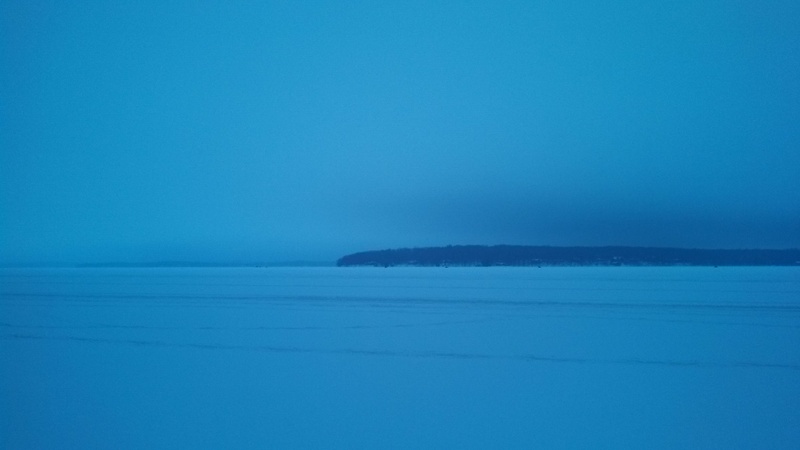 I sighed and called Dolly back towards us, but it didn’t really bother me to go back now – Dolly and I can go out again anytime, so we turned back towards the towering embankment of Lac Courte Oreilles. On my last walk, I misjudged the sheer steepness of this hillside which caused me a lot of grief climbing to the top of it. This time, we carefully picked a spot that proved to be a much better choice. Our ascent went relatively well, especially since we had our poles, and of course I had crampons to grip the snow with. The last leg homeward – the level ground along the few cabins on Wolf Point, was entombed in a solid 3 feet+ of heavy virgin snow. Our travel was slow going, especially since Dolly was pretty much buried this time. I now wished I had the aspirin for me, just in case…..
Back in the warm cabin we peeled off our outerwear while Dolly chewed snow-balls from her curly fur. I looked at Greg as he stepped out of his snowpants and saw that he was dripping wet from head to foot, not just damp, but so wet that I could of squeezed a bucket of water from him. “Guess I overdressed” was all that he muttered while I made some hot chocolate. Finally, all the snowballs were off Dolly, Greg was in dry clothes, and we were sipping steaming hot chocolate while discussing the pros and cons of each of our snowshoe styles. The new ones are sleek, light and wonderful to use but there is just something about those worn out wooden snowshoes that I just can’t put a finger on… its almost like there is a bit of magic woven into those old frames. They seem to light a mystical spark in whoever wears them. Even Greg, not someone I’d ever peg as a snowshoeing enthusiast, now talked about how we must go over to his hunting land and snowshoe through the heavily wooded rolling hills there. I’m still not sure if that was really him talking, or the old wood snowshoes whispering…. This entry was posted in NORTHWOODS LIFE, Snowshoeing and tagged aluminum snowshoes, cathy lareau, snowshoeing in Hayward wi, snowshoeing in northern wisconsin, winter in hayward wi, wood snowshoes. Bookmark the permalink.